Shringeri Sharadamba Temple is in Chickmagalur district of Karnataka state in India. Sharadamba Temple is an 8th-century temple, founded by Sri Adi Shankaracharya. Sri Sharadamba is the presiding deity at the Temple. The temple has a magnificent history to tell. Original Sharada idol was made of Sandalwood over the ‘Sri Chakra’ installed on a rock carved by the great saint Sri Adi Shankara. Presently the idol is a golden idol which was installed by Sri Bharati Krishna Tirtha in the 14th century. Temple was also made in Kerala style with titled roof and timber by him and Sri Vidyaranya. The original sandalwood idol is now installed at the Sri Vidyashankara temple in Sringeri. Other improvement works were done to the temple walls and pillars also. A golden chariot was dedicated by Jagadguru Shankaracharya Sri Bharati Tirtha Mahaswamigal to the temple in 1999. Golden doors were also installed at the temple in connection with Jagadguru’s golden Jubilee. The golden door covering has “Ashta Lakshmi” figures which is a beautiful piece of work. Sringeri Sri Sharada Peetham is the First Math established by the Great Sri Adi Shankaracharya, considered as one of the most revered Hindu Philosopher and Theologian who established this Math in the 8th century. “Navaratri” is the main temple festival which is celebrated every year for 11 days. How Do I Go to Shringeri Sharadamba Temple? Mangalore is the nearest airport to Shringeri Sharadamba Temple at around 71 kilometers distance. Mysore is at around 200 kilometers distance. Udupi (UD) and Barkur (BKJ) railway stations are at around 55 kilometers distance from the temple at Shringeri. Bangaluru (earlier known as Bangalore), the capital of Karnataka state, is at around 330 kilometers from the famous temple town of Shringeri. Shringeri Sharadamba Temple is open to devotees from 6 am to 2 pm and also from 5 pm to 9 pm. Dwarkadhish Temple is at Dwaraka in Jamnagar district of Gujarat, India. The Dwarakadhish Temple, Dwaraka, is one of the four Hindu temples of Char Dhum Pilgrimage tour and is considered as a very sacred temple by Hindus. The Dwarkadhish temple at Dwarka, Gujarat, India. It is believed that every Hindu must visit these 4 Char Dham temples at least once in his or her lifetime to attain salvation. Other three Char Dham temples are Badrinath temple in Utterkahand state, Jaganath Puri temple in Odisha state and Rameswaram temple in the state of Tamilnadu. The four Char Dham temples makes a perfect square with Badrinath and Rameswaram falling on the same longitude and Dwarka and Puri lying on the same latitude. These 4 temples represents the farthest points of India existed during the time of Great Hindu philosopher and reformist Seer Adi Sankarachraya, who defined these Char Dham temples. How do I go to The Dwarkadhish Temple? 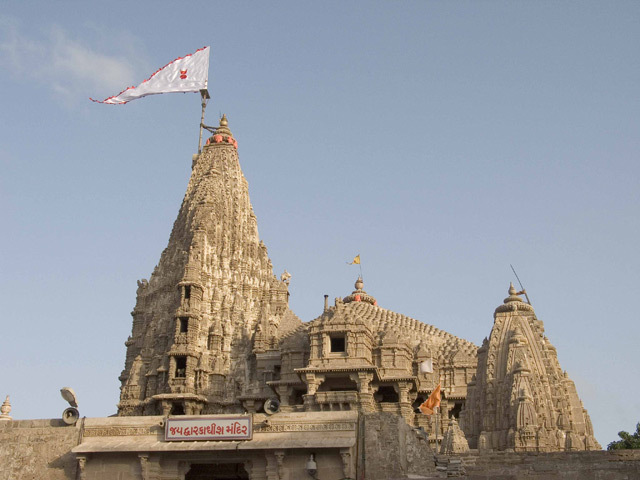 The Dwarkadhish Temple is well connected by roads to other parts of the country. Ahmedabad is around 450 kilometers from Dwarakadhish Temple and Mumbai (or Bombay as it was known earlier) is at 950 kilometers distance. Jaipur, the capital of Rajasthan state is at 1025 kilometers away. Jamnagar is the nearest airport at 135 kilometers distance from the Dwaraka Temple. Dwarka railway station is the nearest railway station to the Dwaraka Temple.